This comprehensive text, which has been extensively revised with new material and additional topics, utilizes a practical slant to introduce health professionals and students to epidemiology, biostatistics, and research methodology. It draws examples from a wide range of topics, covering all of the main contemporary health research methods, including survival analysis, Cox regression, and systematic reviews and meta-analysis—the explanation of which go beyond introductory concepts. 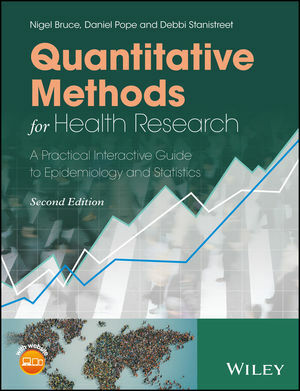 This second edition of Quantitative Methods for Health Research: A Practical Interactive Guide to Epidemiology and Statistics also helps develop critical skills that will prepare students to move on to more advanced and specialized methods. Quantitative Methods for Health Research, Second Edition is a practical learning resource for students, practitioners and researchers in public health, health care and related disciplines, providing both a course book and a useful introductory reference. Nigel Bruce, PhD is Emeritus Professor of Public Health at the Department of Public Health and Policy, University of Liverpool, UK. Daniel Pope, PhD is Senior Lecturer in Epidemiology and Public Health at the Department of Public Health and Policy, University of Liverpool, UK. Debbi Stanistreet, PhD is Senior Lecturer and Faculty Director of Widening Participation at the Department of Public Health and Policy, University of Liverpool, UK.